Muthini's grandmother has to send him to a school because raising both him and her other grandchildren has become too difficult. Based on the life of a real Kenyan boy. 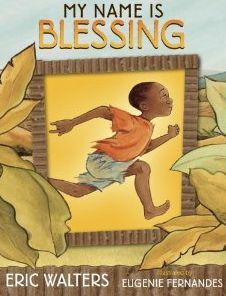 This book is based on a true story about a boy named Muthini. Muthini lives with his grandmother and eight cousins in one of the rural villages in eastern Kenya. Muthini has a physical disability, which makes both adults and children treat him differently (e.g. insults and teasing). As a result of poverty and old age, his grandmother is unable to support him and she places him in an orphanage. However, before Muthini can be accepted in this orphanage, he has to change his name from Muthini, which means suffering, to Baraka, which means blessings. The use of authentic cultural names and fabulous illustrations are commendable but the book perpetuates stereotyped Africa that is poor, hungry, and suffering. Also, the illustration of flying beings at night may be interpreted as wizards, again propagating a stereotype, that of witchcraft in Africa. The children’s drawings of wildlife (at home and in school) perpetuate the myth that Africa is a jungle full of big game animals. Finally, the author’s note includes the terms “tribe” and “tribal” both of which are misleading in the American context. Children should read this book with books which give a more balanced view of Africa.